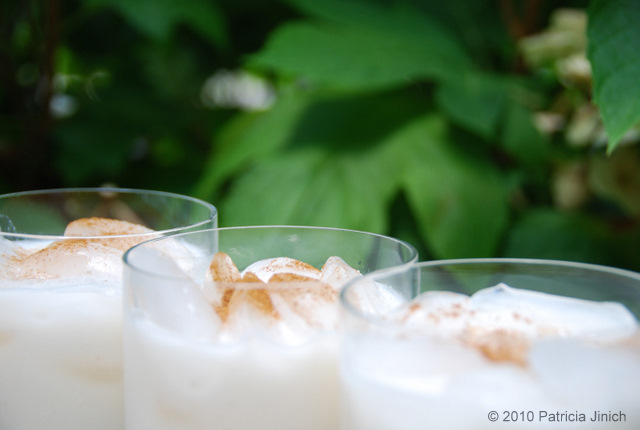 Horchata is a cool, refreshing, and sweet drink commonly found in Latin America and Spain, as well as a few other areas, including the United States. One of my favorite drinks since childhood, Horchata is a traditional, blended beverage made from rice, almonds, tiger nuts, etc. It’s a wonderful companion to most foods, and is sweet enough to delight any set of tastebuds without being so sweet that it would make people cringe. After having scoured the internet for a simple recipe that still results in great flavor and consistency, the the one that I have judged to be the best is by user coffeebean53, from www.GroupRecipes.com. 1. Combine the rice, cinnamon stick, and water in a bowl. Cover it and refrigerate it for at least 2 hours, but preferably overnight. 2. Remove the cinnamon stick. Then, spoon the rice into a blender and blend it on high for 3-4 minutes until the mixture is as smooth as possible. 3. Then add the water from the rice mixture as well as sugar. Blend for another 2 minutes. 4. Strain the mixture with a cheesecloth (or some equivalent) into a pitcher until a paste remains. Discard the paste. 5. Stir evaporated milk into the mixture. 6. Serve chilled in tall glasses with ice cube, and possibly more sugar if needed. Then garnish it with the lime rind and the cinnamon. Horchata is truly a versatile and delicious drink that is suitable for a great deal of occasions, and will be a hit at any meal, especially on a hot summer day.